Dr Kevin Bonham: What Are The Prospects For A Labor-Green Senate Majority? Labor and the Greens have a combined 35 seats and need to gain four for a total of 39 and a Senate majority. Since winning two seats in the ACT looks unrealistic (see more below) the most obvious pathway would be to gain at least one seat in NSW and SA, hold four seats in Tasmania, and achieve two other 4-2 splits against the Coalition (Victoria and somewhere else). In this article I will frequently refer to the "default result". The default result is what would have happened in 2016, based on the votes cast, had 2016 been a half-Senate election. This result is known in most cases (with the odd wrinkle) from the Section 282 counts that are done to inform the Senate (so that the Senate can then ignore them) on exactly this point. (See Majors Stitch Up Senate Term Lengths, Film At 11.) Of course, had it been a half-Senate election parties could have strategised differently and achieved different vote shares, but the default result provides a good starting-place for considering what needs to change for Labor and the Greens to increase their seat share. Section 282 recounts need to be treated with some cautions even as indicators of what would have happened at the last election had it been a half-Senate poll. One of these is that in the larger states, significant numbers of votes were excluded from the Section 282 counts because they did not reach any of the 12 winning candidates. This has the effect of making parties that poll quotas more competitive in the Section 282 counts than if these votes were not excluded. I've adjusted for this in the modelled figures for competing parties that I give below. I don't think anyone has previously looked at what would have happened in Section 282 recounts for which such votes were not excluded, but it looks like in one case it would actually have made a difference. It's arguable whether the current Section 282 method is unfair (since in some ways it is closer to what might happen with a progressively recalculated quota, albeit crudely) but certainly it creates issues with using the Section 282 counts as a model of what would have happened last time. In terms of polling, we have national Reps primary vote polling (such as aggregated in BludgerTrack) which suggests that for the Reps, we currently have about a 6% swing against the Coalition, about a 4% swing to Labor, a 5% swing to One Nation and a 3% swing away from Others excluding One Nation. Concerning the major party swings, it's possible they could stay like this or even increase, but the lowside of a comfortable Labor-win scenario would be swings of about half this size. The major party swings might be similar in both houses, or it's possible that fleeing Coalition voters might beef up the minor party vote rather than the Labor vote in the Senate. Victoria recently was a pretty good example of the former. If One Nation were to pick up a 5% swing in the Senate, they could be very competitive in many states, so I need to have a bit of a look at that before I go any further. The trick with the apparent Reps swing to One Nation is that they only contested 15 seats in the House of Reps in 2016. These seats were generally strong areas for the party, but even so they only polled 1.29% in the Reps nationwide compared to 4.28% in the Senate (where they were on the ballot in every state). To get a handle on converting One Nation's current Reps polling to a possible Senate result for them I looked at the 2016 Reps vs Senate results for those seats they did contest. 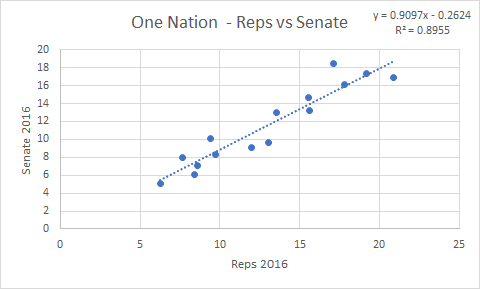 Basically One Nation did slightly worse in the Senate than the Reps in most seats (slightly better in the Senate in Flynn, Longman and Leichhardt) and this relationship looks pretty linear. Extrapolating it to seats where they polled poorly is rather risky, but the suggestion is that their current polled Reps vote translates to a Senate vote of something like 5.6%, a gain of 1.3%. That's assuming it holds through to election day, which it might not. Another possible factor that could dent it is competition from Clive Palmer's United Australia Party. We should remember that Palmer's previous party was frequently polling zero by the end of the 2013-6 term, but the sort of voters UAP is targeting probably won't remember that. In any case, at the moment I don't expect the One Nation Senate vote to go up by a lot. Unlike the days when specific minor parties would often outpoll their Reps vote in the Senate even if they contested all the Reps seats, these days there are too many Senate-specific micro-parties competing for it. My expectation here is slightly at odds with Senate polling for the Australia Institute. After redistributing voters leaning to a party, the TAI Research Now polling (the report has some advanced modelling and is well worth a look, also see the autumn edition) has One Nation on about 8% of the national Senate vote. Here I'm not sure whether even the naming of multiple other parties and provision of an Independent/Other option is enough to overcome the tendency of parties named in a poll to overperform in Senate polling. While the TAI report is more bullish about One Nation's vote and seat chances than me, we agree on the broad picture of a Labor-Greens majority being unlikely. In NSW, Labor and the Greens are defending two seats, but the default result is three. In the Section 282 recount, after the initial two quotas for each major and the elimination of all the minor candidates including the LDP, the Coalition has 14% of the original count to 10.7% for the Greens, 7.7% One Nation, 6.5% Labor. Labor should increase, the Coalition should go down, One Nation should increase, while the Greens might go down in a state where they've had a lot of problems. It's hard to see the Coalition getting eliminated first here, unless the national result is disastrous. If One Nation go out, their preferences help both majors against the Greens (and in the current environment, probably the Coalition more than Labor). Potentially, this could cause Labor to beat the Greens. If either Labor or the Greens go out first, their preferences help each other. If the Coalition do go out, their preferences don't do a lot, but help Labor more than One Nation and One Nation more than the Greens. It's plausible here that if One Nation don't improve and there is a large swing against the Coalition, Labor and the Greens could both win here for a four-seat Labor-Green result. But this doesn't seem to be likely unless the Coalition cop about a 6% swing with One Nation getting not very much, and it also depends on the Green vote not declining much. This seems an outside chance, but currently a more than remote one. In the event that One Nation is not the last non-Green minor party standing, similar comments apply to any other parties that might somehow get up to around 10% after preferences. Indeed, if One Nation performs badly, this probably increases the chance of Labor and the Greens holding off the smaller parties and both winning. Other smaller parties do not in general have One Nation's preference-getting ability, so if (say) the Shooters outlast One Nation in the count, it's still hard to see them winning. The Liberal Democrats might in theory get a brilliant ballot draw and poll say 5-6% (a repeat of 2013's 9% seems unlikely with the use of logos) but the LDP crawl on preferences in these counts. On the left one new name that may be worth keeping an eye on is Father Rod Bower, whose independent campaign might have significant appeal with inner-city left-liberals, soft Greens voters and so on. That said I have so far been sceptical of whether Bower can get significant support across the full range of electorate types in NSW. Verdict: one ALP/Green gain very likely, two gains unlikely but possible. In Victoria, Labor and the Greens are defending three seats and the default result is also three. In the Section 282 recount, after elimination of the smaller parties and two seats for each major, the Greens have 14.8% of the original count, Derryn Hinch Justice Party has 9.6%, the Coalition has 8.3% and Labor has 5.7%. This gives the Greens a small surplus, then Labor is excluded and elects Derryn Hinch. It is unknown whether Hinch will run again, and if he doesn't (or runs but his vote drops badly), his votes would benefit Labor, making a Labor gain alongside the Greens much more likely if there is a swing to Labor generally. Assuming Hinch runs and matches his 2016 performance, a modest swing to Labor and a modest swing against the Coalition would put the Coalition out, in which case Hinch wins on Coalition preferences provided the Coalition put him on their card again. However if there is a large swing to Labor on primaries, putting Labor way ahead of Hinch, even that wouldn't be enough. Again, there's nothing currently to suggest other parties are in the mix in Victoria. Verdict: ALP/Green gain very likely if Hinch doesn't run, but fairly unlikely if he does. In Queensland, Labor and the Greens are defending three seats, which is also apparently the default result. Hang on a minute, you might say, didn't the Queensland Section 282 recount give only two Labor seats and no Green ones? This is where the obscure point I made at the top about the recounts being a defective model kicks in. By my quick calculations if one includes all the formal 2016 votes then Larissa Waters would probably be a half-Senate winner (by just under 1000 votes, so somebody may want to check this, in case it's not actually true.) The key point is, if she wouldn't have won, it would have at least been very close. At a certain point, One Nation is just over quota based on the original count (15.1%) with the LNP on 11.1%, the Greens on 10.7% and Labor on 1.8%. (In fact, based on the 2016 results, Labor's third candidate would be excluded as they did not reach two quotas on primaries - but it is worth noting where they would be in theory as a basis for estimating swings.) Basically, Labor are too far behind to win a third seat even with a healthy swing to them. However any increase in their primary shores up the Greens in their fight with the LNP. In theory if One Nation poll badly they might fall below the LNP and get eliminated, but this doesn't look likely on these figures since the LNP will probably go backwards themselves. (There's speculation competition from UAP/KAP/Fraser Anning might knock the One Nation vote down enough if votes for those parties exhaust, and another small factor is that Hanson herself won't be on the ballot.) The other possibility is One Nation having a larger surplus that helps the LNP, but in this case the LNP will also have gone backwards too much for it to matter. In any case even if One Nation do drop below both the LNP and Greens this only locks in the Greens seat. Again there doesn't seem to be much sign of anyone else getting in the mix. Verdict: high chance of status quo. In WA, Labor and the Greens are defending three seats and the default result is also three. At the key point in the WA Section 282 recount, after the first two quotas for the majors the Coalition has over a third quota based on the original count (15.6%), the Greens have a quota (14.3%) and next come One Nation (7.6%) and Labor (3.0%). I suppose one should entertain that maybe the Coalition vote might crash enough and One Nation go up enough for One Nation to take the Coalition seat, but that has no effect on the Labor/Green balance anyway. I can't currently see how the Greens don't win and I can't see a way to get Labor close to three, or anyone else (such as WA Nationals) getting in the mix. Verdict: very high chance of status quo. In South Australia, Labor and the Greens are defending one seat each, but the default result is two Labor and no Greens. South Australia is a very tricky state to apply the sort of modelling I have been using above, because the former Nick Xenophon Team polled a pretty strong result with Xenophon on top of its ticket in 2016. The default result is therefore two Liberal, two Labor and two Centre Alliance (the new name for NXT) but the extent to which the CA will hold up under a new name, with no Xenophon and no incumbents, must be questioned. In the 2016 SA Section 282 recount, Labor just gets over two quotas, but if the full original count is used they fall very marginally short. At a certain point based on the original count NXT have 9.5% of the original count after their first quota, the Greens 7.5%, the Liberals 5.29% and Bob Day 5.24%. It doesn't matter which of the Liberals and Day (who is no longer a factor anyway) go out first since neither can win; in the end NXT beat the Greens by 5.5% in the S282 recount and a similar margin using full figures (SA is the least affected by the excluded-votes issue). If both the Liberal and Centre Alliance (ex-NXT) votes drop and the Labor vote comes up, it becomes possible for the Greens to win the second CA seat instead. If Labor do extremely well they could become a threat to the Greens' seat, but at the moment this looks very unlikely. It is possible to overplay the extent to which the CA vote might collapse. At the SA state election the SA-BEST vote (this is the state version of NXT/CA) was down only slightly on the NXT Senate vote from 2016, and on the state election figures SA-BEST would probably have just beaten the Greens to their second Senate seat on preferences. The question is whether the brand support will also translate to the Centre Alliance enough to keep the CA in the hunt, especially when they may well only run 4-5 lower house candidates. At this stage it's quite possible that after the initial quotas, no-one in SA will have even half a quota of primary support, and for this reason there's a chance of somebody unexpected winning if they can get 4-5%. One Nation polled 3% there in 2016 and wouldn't need much more to sneak into the mix (though I don't see where they would get preferences from), Tim Storer might suddenly become a cult candidate, the Australian Conservatives might bang the rocks together (though based on the state election result, one doubts it) and so on. Any win by an unexpected party would probably be at the Greens' expense if it happened. If the Greens win, it should be at the expense of the CA. I have seen some suggestions that the CA might collapse completely and not win anything. For instance the current BludgerTrack state breakdowns have the CA on only 5.9% at Reps level. There has been very little specific polling of the CA vote and there may be a familiarity issue with making voters realise it is the same thing as NXT/SAB. For these reasons I am cautious about this suggestion at the moment. If the CA vote does collapse to this extent then there is a theoretical possibility of two ALP-Greens gains in SA. In the Tasmanian Section 282 recount, using the full original count and after the first two quotas each for the majors and the elimination of minor parties, the Greens have 13.2%, Jacqui Lambie 13.1%, Labor 8.7%, Liberal 6.1%. Liberal preferences put Lambie over quota; in the Section 282 recount Lisa Singh then loses to the Greens by 2%, but on full figures it is more like 3%. In Tasmania, it's risky to factor in assumptions about the national swing, because the Liberal campaign in 2016 in the state was seen as particularly bad - something that was more apparent in the poor flow of preferences from other parties than in the primary vote. The Section 282 recount also understates the Liberals' position slightly, because it doesn't include those below-the-line votes for Richard Colbeck that did not stay within the Liberal ticket. Then again had Colbeck not been demoted to a loseable position, he may not have got those votes in the first place. Labor don't need to pick up all that much before they take the Greens' seat away (something that is somewhat more plausible than I realised before writing this article.) However Labor are coming off a very good result in the state in 2016, making further advancement more difficult, while the Green result must have been close to rock bottom. The only way in which Labor might win three with the Greens also getting one is if Lambie's vote declines enough for her to fall behind both. Currently this requires a nearly 4% change in the gap between Lambie and Labor at the point after Liberal preferences. The other complication in Tasmania is the demotion of Senator Lisa Singh to fourth on the ticket (again). If Labor do well enough to be fighting with Lambie or the Greens, then the breakdown of their vote by candidate becomes very important. In 2016 Singh polled 6.1% of the primary vote and reached the DD quota of 7.7% on below-the-line preferences. A repeat performance would very probably mean that John Short (Labor #3) is again eliminated with Singh becoming the third candidate. But if the below-the-line vote for Singh falls, Singh could be eliminated as a candidate, resulting in massive leakage that would probably sink Labor's chances. Lambie's vote may be dented by competition from other populists such as UAP and independent Steve Mav, also perhaps by competition from Martin. The above shows that she has a reasonable amount of slack if her voter appeal has basically remained intact. Whether it has during her time back in the political wilderness after losing her seat to Section 44 issues remains to be seen. The Liberals shouldn't be completely written off for a third seat either, for the reasons stated above, but even if they manage to get into the mix with Lambie, Labor and the Greens, I don't see where they get preferences from. The possibility of Labor and the Greens taking the two ACT seats leaving the Liberals with none used to be often talked about in the pre-2016 Senate system, the idea being that if the Liberals were below quota and everyone else preferenced the Greens, the Liberals might never make quota. It never quite happened like that (there was a near miss in 2013 that was foiled both by below-the-line votes and the Animal Justice Party preferencing the Liberals above the Greens - either factor would have foiled it alone) but in the new system it is much less realistic. In 2016 Labor polled 37.9%, the Liberals 33.2%, the Greens 16.1%. Exhaust is very low in the ACT so strong preference flows between parties are possible, but as with House of Reps flows they don't tend to be stronger than about 80-20. So even if, say, Labor were to poll 43% and the Liberals a mere 25%, the Liberals would still have a few points in hand over the Greens. Also the point about preference flows being strong applies to preferences from smaller right-wing parties (LDP, Christian Democrats) as well as smaller left-wing ones (AJP, Reason). So the flow from the remaining parties isn't likely to help the Greens enough for them to pick up the remaining points. Update: In comments Blair Trewin suggested the preference flows I had might be a bit weak given the nature of Canberra ALP voters. I did have a play around with the 2016 ATL preference flows on David Barry's site before posting, but hadn't checked the BTL votes, and hadn't been all through the ATL flows either. I have now checked this and the following are the approximate 2016 preference flows for Greens (#1 candidate) vs Liberal (#1 candidate) from each party. Note 1: These are slight overestimates of the formal flows because my method does not take into account cases where expressed preferences for both parties are informal. Note 2: There is a small error rate that could be caused by cases where a voter voted both above and below the line but with the parties in different orders. Note 3: Breakdowns do not sum to 100 because some votes would not have reached either party. By comparison, Greens voters preferenced Labor over the Liberals 89.0-8.5. Why is it so, when normally Green preference flows to Labor over Liberal and Labor preference flows to Green over Liberal in single seats are pretty much the same? I suggest it is so because Labor voters followed how-to-vote cards much less in the Senate in 2016 than they usually do in single seats. It is quite possible Labor preferences will flow more strongly to the Greens this time than last time. PS 5/3: Some more analysis. If all preferences were thrown, the Liberals would have won last time by 15.1%. So if the action was purely between Liberals and Greens, that would need a 7.6% Liberal to Green swing. It's not likely this will happen by itself. But there are some other things that might happen. Firstly, the Labor preference flow to Greens could intensify, though that doesn't make a huge difference by itself, since even increasing it to 85-10 would only close the gap by about 0.9%. Secondly, any vote that swings from the Liberals to Labor helps, but not as much as if it went to the Greens. Thirdly, some Labor voters could start strategically voting Green to get rid of Seselja. This has been canvassed in previous elections but has never quite taken off. Perhaps my opening assessment "very unlikely" was overconfident - it's still a stretch! For Labor and the Greens to gain the balance of power following a Labor win, virtually everything has to go right. The only realistic scenario I can identify involves Labor beating Lambie in Tasmania, the Greens (or Labor) beating the Centre Alliance in South Australia, Hinch not running or Labor beating him in Victoria, and the Coalition crashing so badly in NSW that Labor get three and the Greens one there. Barring a true landslide result (56-44 or more) in the Reps it's hard to see any of these as better than tossups at present, and some look decidedly less likely. The median result for Labor and the Greens if there is a comfortable but not enormous victory is probably a gain of one or two seats. A gain of one seat (assuming that the CA win a seat in South Australia, or two seats if they don't) would mean that legislation supported by the Greens and Centre Alliance would pass. Weaker results might require help from other centre/all-over-the-place crossbenchers such as Hinch and Lambie. 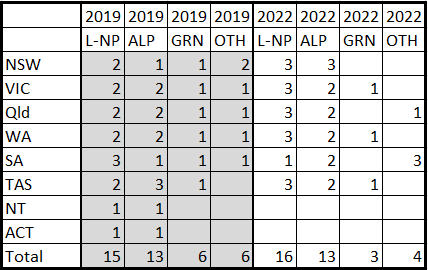 It doesn't appear likely that Labor would routinely need help from more clearly right-wing crossbenchers, and at the moment it looks likely that there won't be many of those left (perhaps just two or maybe three One Nation and Bernardi) after this election anyway. This article does not claim to be an unequivocal prediction of the next election result - rather it is a conditional and provisional model. The main condition on the model is firstly that Labor wins the election in the Lower House comfortably (though not necessarily massively). The second is that there is no national breakout success by a party not currently on the polling radar. I'm not sure the abolition of GTVs is quite as fatal to the prospects of a second ALP/Green seat in the ACT as suggested here. The type of traditional working-class Labor voter who might preference the Liberals over the Greens is pretty thin on the ground in Canberra, and I could certainly imagine a Labor-to-Green preference flow near or above 90%. In 2016 the micros got 13%, split fairly evenly between left and right. Assuming that preference leakage from left micros and right micros cancels out, that means the Liberals would probably need the Liberal + right micro vote to be at least 32% or so (in 2016 it was in the 39s). The ACT rarely swings big so you'd think 32% is likely - but then Canberra has plenty of the sort of Liberal voters who left the party in droves in places like Hawthorn in Victoria, so you never know. ACT section expanded - Green-to-Labor flows 90% but Labor-to-Green doesn't. Of course this time it might shift, as a Morrison-led campaign could be much less appealing to a stereotypical ACT Labor voter than a Turnbull-led one. Then - 80% of Labor prefs go to Greens (5% more than last time because of the Malcolm/ScoMo factor) giving them another 11.2% - a QUOTA!!! And if they fall just short a few prefs from others might still do it. Likely? Nah, not really - but if it does happen I'm going to claim bragging rights for having predicted it! That would require an over 9% swing on primary votes to Labor and just over 6% to the Greens. I'd be very surprised if both of those happened at the same time. Zed Sesljia seems to be personally quite unpopular in the ACT, even among Liberal voters (who are much more likely to be the "small l" kind of Liberals in Canberra). Not sure how much that'll actually affect his vote but it might be something that needs to be factored in. He was also the candidate last time so it is only whatever new unpopularity he's acquired in the past three years that needs to be factored in - that said, there probably is some. I think he's done quite a few unpopular things since 2016, particularly backing Peter Dutton in the leadership spill and voting against the ACT being able to legislate voluntary euthanasia. Great article Kevin. Had been thinking there was little chance of a Labor+Green majority, given how many 3 year seats they're defending, and it's great to see your analysis in each state. One quibble: wouldn't Labor+Green need to gain only 1 seat, reaching a total of 36, in order for legislation to pass with Green and Centre Alliance support? Centre Alliance should have at least 3 seats (2 six year seats from 2016 and at least 1 seat from 2019). Yes, that's correct assuming the CA win a seat (thereby gaining a seat compared to their current holdings.) Ta.